In 1999, a partnership was formed between the Presbytery of Chicago and the Presbytery of Havana and, in 2008, PCWS members Loretta Gracias Bremer & Ann Beran Jones travelled with others from our Presbytery to the island of Cuba. The group visited the Presbyterian Church in the town of Nueva Paz and returned very excited about this small church – they thought it would be a good match for PCWS. Later that year, Nancy Glickman & Jane Boxell, members of our Mission Committee, returned to Nueva Paz and met Maricela Gonzalez, who served as the Pastor in Nueva Paz for nine years. Members of this small church made them feel welcome and, upon returning to Western Springs, they recommended to our Mission committee that we form a partnership with Nueva Paz. At that time, there were several other Chicago churches with church partnerships in Cuba. At last count, there are now nine Chicago-area churches with partnerships in Cuba. When asked why she keeps returning to Nueva Paz, Jane’s reply is “Because of the people. They are so warm and friendly.” From the beginning the Nueva Paz members wanted a relational partnership. They just want friendship, and they like the fact that there is another church who cares about them. 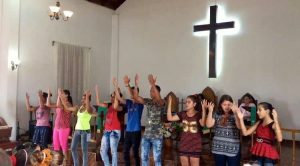 They are encouraged to have a partnership with a church in the United States – a church that will pray for the church, its members, and their country. The trend in the Presbytery is to build friendships and relationships – and the partner churches in the United States are careful not to give too much money. How does PCWS support Nueva Paz? Over the years, PCWS members who have travelled to Nueva Paz have brought multiple suitcases filled with many over-the-counter medicines, craft items, bedding, clothing, computers, books, friendship banners, etc. The craft items are used in the children’s Sunday school classes, and are also gifts for the women who crochet items they sell to support the church. The mission committee also provides a small amount of cash each year. Several years ago, PCWS raised $10,000 (mostly by turning in aluminum cans) for a car for the pastor to use. The car cost approximately $20,000 and another partner church, from Long Island, raised the rest of the funds. We still accept cans (please smash them before you bring them to church) and 70% of the money raised (aluminum recycling brought in nearly $1000 last year) will support our efforts in Cuba. What work did you do during the summer 2017 Mission Trip? Our work is dependent on the supplies they can locate. The church has beautiful wooden doors and shutters, which have been damaged due to termites, water, and hurricanes. They planned to get a professional carpenter to come in and repair what could be repaired and our group planned to sand and varnish them. They also had a sink with no legs that we had planned to fix. When we arrived, the sink had been fixed but the wooden shutters could not be replaced. However, they were able to install a new window and door to the patio. They had black paint for us to paint the metal grillwork on the door, but were not able to locate the matching green paint for the interior of the room where the new door and window had been installed. We also cleaned and painted the exterior of the gathering building with the exception of the base of the pillars as the red paint they wanted to use there could not be located. Additionally, we labeled their chairs. They really appreciate our visits – they like to be able to say they have a partner church, that there is another church praying for them. The people are warm and friendly and they really appreciate what we do for them and what we give them. The work is completed by an intergenerational group of congregation members and laughter fills our time. On behalf of Nueva Paz, PCWS requested a grant to fund a new program – The Nueva Paz Presbyterian Church Breakfast Club – and we were given the full amount! The grant is for $2,000 from the Presbyterian Women of the Presbyterian Church (USA) from their Thank Offering contributions. The $2,000 grant received will be used to feed elderly congregants at the Nueva Paz Presbyterian Church in Cuba. As we’ve noted, Nueva Paz is a poor farming community south of Havana. This rural church and community have many elderly people who live alone in their family houses because many of their children have left the country. The Cuban government gives a very small pension to these elderly people which does not cover their living expenses. The elderly people in Nueva Paz will now receive a nourishing breakfast of eggs, ham, a roll and butter, and coffee; sometimes they will be served yogurt or juice. They will also have the opportunity to socialize, to participate in an exercise program, and to partake in Bible study, all of which are very important to their aging population. Also, this breakfast activity gives the opportunity for the church to introduce themselves to new members, as a mission as well as evangelism. 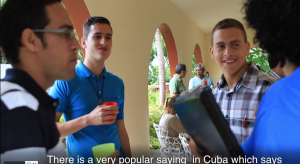 The Presbyterian Foundation has shared a very informative video regarding the work of Presbyterian churches and the Matanzas Theological Seminary in Cuba. To see relational ministry in action, please take a look at the video.